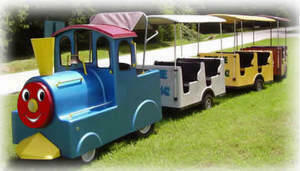 This trackless train holds up to 18 small children. Adults are welcome to ride too! But, please only 1 adult with 3 children per wagon so in total you can have 3 adults and 12 children.